Ok so I wanna be up front. I didn’t make these meatballs myself. So I cheated, but this turns what would have been a bit of a palaver into a 30 minute week night meal. I made the sauce myself, and obviously I cooked the spaghetti myself so that makes up for it – right? The true star of this dish wasn’t really the meatballs anyway, it was the sauce. I added about two tablespoons of pasta water to the sauce, adding starchy water, according to Nigella, allows the sauce to thicken further. The last two I stole from Nigella, again. I think I have a foodie crush! Add the meatballs, onions and garlic to a pan under a medium heat. 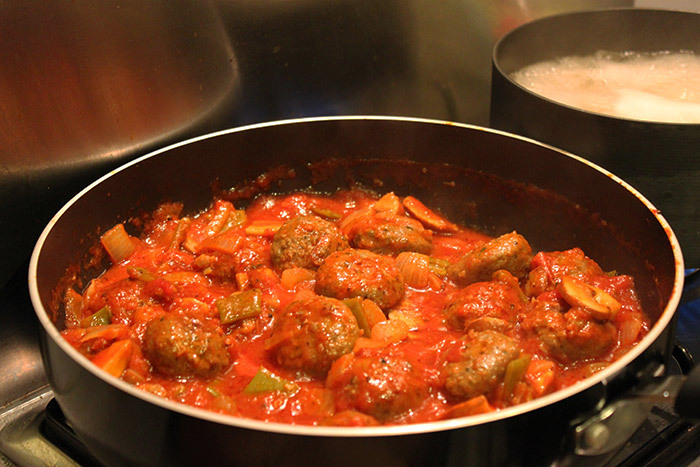 Once the meatballs start to brown on all sides add the tin of tomatoes and then the water from the tin. Stir well. Stir in the vinegar, sugar and tomato paste. Turn down the heat a little and leave to simmer, while you cook the spaghetti as per the packet instructions. Once the pasta is ready spoon out two tablespoons of water and stir into the sauce, then drain the pasta. Plate the pasta and pour over sauce and meatballs. Enjoy. I only recently started eating meatballs at all, after a wonderful recipe in GoodFood for Red Thai Meatballs Curry. Since then I have a kept at least one pack of meatballs in my freezer at all times. Although I guess my next experiment has to be making them myself from scratch – wish me luck!